Aberdeenshire folksinger, Iona Fyfe, has become one of Scotland’s finest young ballad singers, rooted deeply in the singing traditions of the North East of Scotland. Winner of Scots Singer of the Year at the MG ALBA Scots Trad Music Awards 2018, Iona has been described as “one of the best Scotland has to offer.” (Global-Music.de) With a number of high profile appearances under her belt, Iona, a mere 21 years of age, has toured throughout the UK, Poland, France, Germany, Austria, Italy, Switzerland, Czech Republic, Canada and Australia. Iona has performed with the BBC Scottish Symphony Orchestra as part of the World Premiere of Disney Pixar’s Brave in Concert at Glasgow Royal Concert Hall. 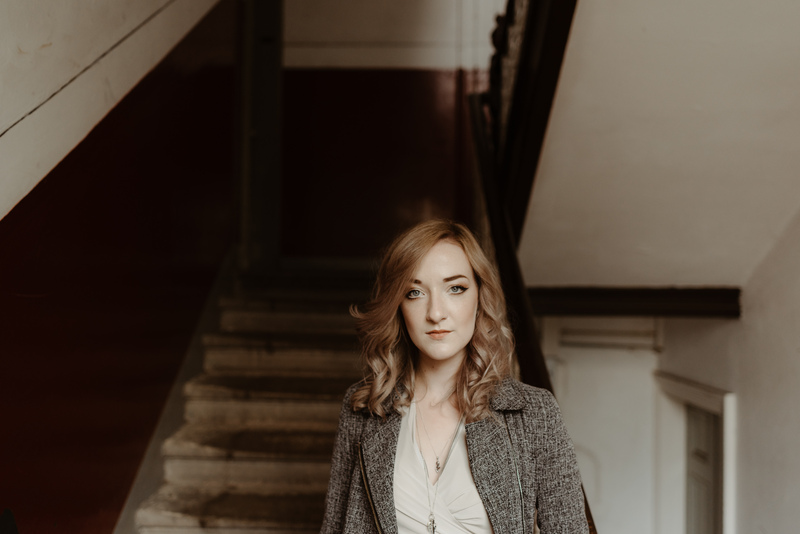 Released in 2019, Dark Turn of Mind is Iona’s first EP entirely in English and features six ballads and songs found in both Appalachia and Aberdeenshire and has been described as “a new interpretation to the country genre” – Maverick. Iona’s debut album Away From My Window was held to critical acclaim and received nationwide airplay on programmes such as BBC Radio 2 The Folk Show with Mark Radcliffe, BBC Radio Scotland’s Travelling Folk, Take The Floor and BBC Radio Nan Gaidheal. An exploration of her unique style and songwriting voice, Away From My Window features archive material of singers such as Stanley Robertson and Lizzie Higgins whilst drawing on the work of more recent songmakers such as Michael Marra and Aidan Moffat (Arab Strap). Produced by Jani Lang, of Dallahan, Away From My Window features a stellar folk line-up of musicians such as Luc McNally (Dosca), Tim Edey (Tim Edey Trio), Charlie Grey (Charlie Grey and Joseph Peach), Simon Gall (Salsa Celtica), David Foley (RURA), Graham Rorie (Gnoss), Charlie Stewart, and Ross Miller. “Away From My Window” was premiered at a sold out Celtic Connections performance featuring a larger musical ensemble and live on-stage sampling of source singers. Iona studied Traditional Music at the prestigious Royal Conservatoire of Scotland, based in Glasgow. Iona has gained a FLCM in Scottish Traditional Voice from The London College of Music and is one of six National Directors of the Traditional Music and Song Association of Scotland.